Today’s occasionally boisterous and debaucherous Izakaya can trace their history back to the altogether more refined tea-houses in Japan’s Edo Period, which began to sell sake and simple dishes around the 17th Century. 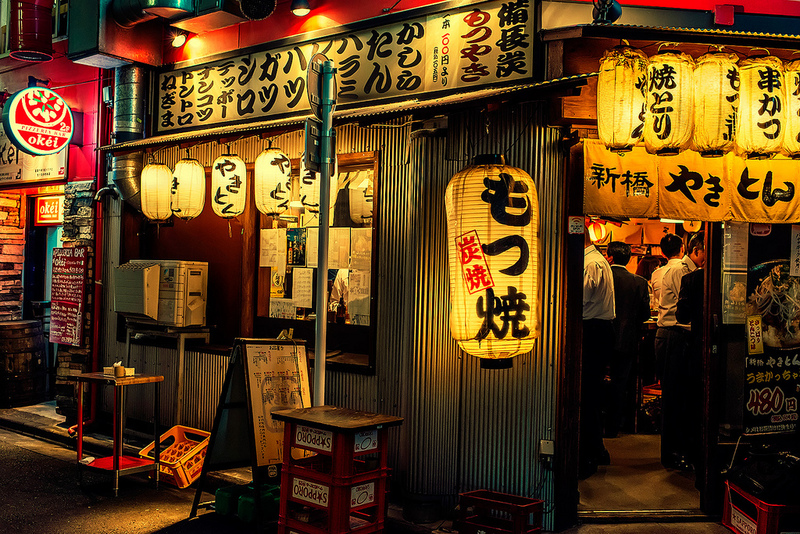 The word ‘Izakaya’ is a compound word, with ‘I’ meaning ‘to stay’ and ‘sakaya’ meaning ‘sake shop’. In the past century, they became popular with hard-working salarymen needing to wind down with booze, fags and fried food, as well as friends and colleagues looking to kick back in a non judgmental, easy-going atmosphere. FIND ONE – look out for the comforting glow emanating from hanging lanterns to identify your Izakaya. ENTER – and be welcomed by a hearty Irrashaimase. 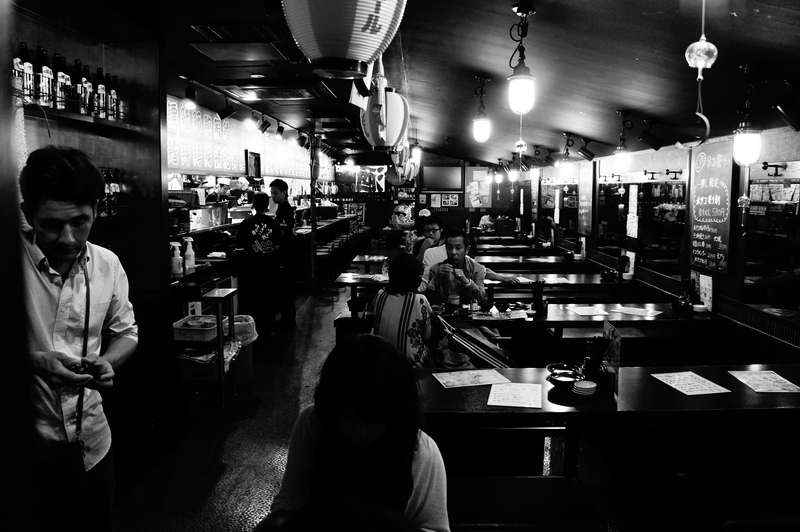 TAKE A PEW – depending on the Izakaya, this might be at the bar counter (popular for single diners, who are always welcomed), in a booth separated by sliding doors and paper walls or sat on the tatami floor. WIPE – make use of the hot towel offered to you with which to refresh yourself. ORDER- many Izakaya offer nomi-houdai or tabe-houdai, meaning all-you-can-drink or all-you-can-eat respectively. This dangerously tempting combo can work out a total bargain and ensures drunken revelry ahoy. DRINK – most izakaya dwellers start off with a refreshing nama-biru – draft beer, especially rewarding during the stifling summer heat. Sake, shochu and umeshu beverages are also popular. EAT – rather like tapas, Izakaya dishes are small and plentiful. To order, simply press the bell to bring the attention of your waiter, or exclaim SUMIMASEN (EXCUSE-ME) as loud as your lungs can manage – don’t worry, it’s not rude in Japan! RELAX – the key aspect that unites all Izakaya. These places are made to be casual, so relaxation and unwinding with plentiful drinks and food are the orders of the day here. AND BEYOND – a karaoke session butchering Bonnie Tyler’s Total Eclipse of the Heart? Bars? Clubbing? General debauchery? Having a mournful weep and falling asleep in your chair? After an intense izakaya session, all societal pressures are stripped away and anything becomes possible. With our selection of Izakaya classic recipes and the best selection of Japanese booze this side of Tokyo, all you’ll need is some makeshift paper lanterns to recreate an Izakaya atmosphere in your very own home. Karaage, otherwise known as ‘Japanese Fried Chicken’ (JFC), is insanely popular in its homeland. Marinated, coated in breadcrumbs and fried, combine it with a chilled beer for the ultimate Izakaya coupling. Try our Karaage Recipe. Walk down any Izakaya lined side street in Japan and it won’t be long before the wafting scent of grilling yakitori skewers tempt you in. Gyoza are another Izakaya classic that can be steamed or pan fried to perfection. They’re super fun and surprisingly easy to rustle up at home. Try our Gyoza Recipe. “Eat yourself into ruin” is the motto of the boisterous city of Osaka, and the city’s residents practice what they preach with plates and plates of Kushiage Deep Fried Skewers, coated in panko breadcrumbs and deep fried. Try our Kushiage Deep Fried Skewers Recipe. In much the same way that one can’t envisage Japan without Mt. Fuji, it is impossible to regard the Izakaya without the accompaniment of golden beer. Our Japanese beer selection is the best in town, including premium craft beer. From the finest Gekkeikan daiginjo to easy drinking table sake, sipping on sake is a popular activity throughout Japan’s countless Izakaya. Luckily, we’ve got a huge range of sake to choose from for your perfect Izakaya evening in. Check out our sake cocktails. When bellies are full of beer and fried delights, it is common to move on to Shochu, one of Japan’s most undersung beverages. Our selection includes Shochu distilled with buckwheat and barley. Try our Shochu Cocktails. Popular in summer and favoured by those with a sweet tooth, umeshu is a tasty alternative to beer and spirits. Also known as ‘plum wine’, it’s a punchy, likeable drink that goes down a treat in the Izakaya. Try our Umeshu & Gin Cocktail. We’re delighted to see that Izakaya restaurants are becoming increasingly popular over here in Blighty too, with new establishments popping up like nobody’s business. Keep an eye out for them, and remember to pay a visit to our little bro Shoryu Ramen, which encapsulates an Izakaya atmosphere at a number of locations in London. We’d love you to have a go at recreating the wonders of the Izakaya in your own home. Why not grab your supplies from Japan Centre, throw an Izakaya party and send us snaps of the resulting revelry? Posted in Food, Travel and tagged izakaya, Japan drinking culture, japanese alcohol, Japanese beer, Japanese izakaya, Sake, shochu. Bookmark the permalink. Reblogged this on O quitandeiro. Thank you for sharing this insight about the drinking culture of Japan. Japan is all about tradition and ceremony, and drinking is not just drinking when it comes to the Japanese. These recipes that you shared really goes well with drinking, especially the gyoza!